So who says Irish soda bread HAS to be made in a round or loaf pan? 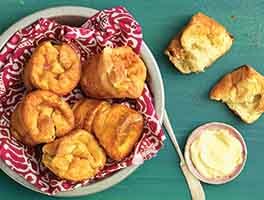 These coffee-break-sized muffins, bursting with tiny sweet currants and a hint (or a hit, your choice) of caraway, are the perfect offering for St. Patrick's Day -- particularly if you're looking to celebrate with something other than corned beef and cabbage! This is not at all a traditional Irish soda bread, which would be simply made with whole-wheat flour, baking soda, salt and buttermilk. 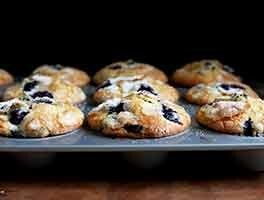 Thoroughly Americanized, these muffins have traveled a long, long way from their Irish origin -- as have most of us Irish-Americans. I baked this before and it was good. 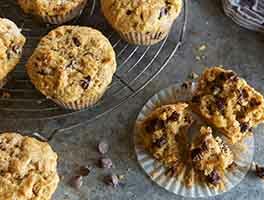 Today, the recipe seems quite different and my dough is way too dry to put in a muffin cup tray. Is the recipe really correct??? Wonderful recipe! Everyone who's eaten them wants more. Definitely a keeper. 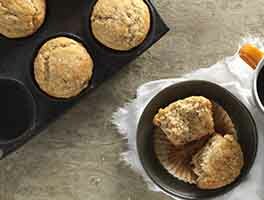 Somewhere between a muffin, a drop biscuit and a yummy scone! 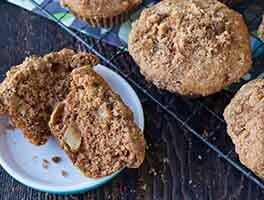 These are crunchy on the edges, great with coffee and look festive with the sparkling sugar. I took the lighter choice on the caraway seeds and will probably put a bit more in the next time for a little more flavor. I had to mix mine a little more than I inferred from the recipe, probably 15-20 passes with a spatula, to get everything moistened, but they didn't come out tough. I will make these again!! I made these today using the sour cream and melted butter. Baked at 375 for 20 minutes and they came out perfect. Definitely would make these again! OMG. These were fantastic. Just had my chef's sample out of the oven. So pleased to get these on the table in 30 minutes instead of 1 hour 15 for regular Irish soda bread. As a tip, I chop raisins when subbing them for currants. OMG. These are fantastic. Followed recipe exactly. So pleased to get these on the table in 30 minutes instead of 1 hour 15 for regular Irish soda bread. 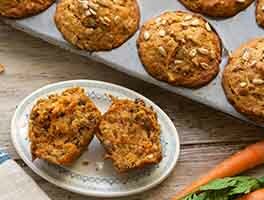 Hi bakers, I just made these yummy muffins. I did lower the temp to 375 because i have a dark pan. I baked them for 18 minutes. I zested one lemon and left out the caraway seeds. I sprinkled the top with sparkle sugar. I used dark raisins. Golden raisins would be good also. They are so yummy. Next time I will try orange zest and cranberries. Yummy both warm or room temperature. Enjoy. I followed the instructions to a T and the recipe as well. Everything came out perfect. I could not ask for anything better. Thank you.